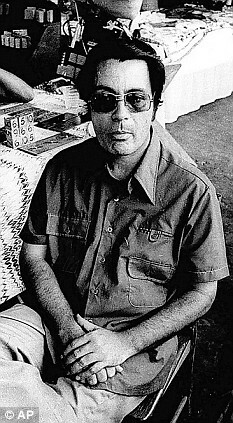 Bodies at Jonestown…mass murder or suicide? Jonestown, of course, is the name synonymous with the mass deaths of the infamous (mainly American) Peoples Temple cult members in the jungles of Guyana. 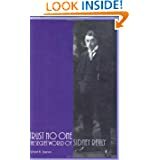 Since that dreadful event, in November, 1978, there has been considerable speculation on whether the deaths were suicide, as per the official story, or mass murder. If ‘Undergrounders’ (group members) are correct, most believe it was mass murder. One compelling argument proffered to support this view is that many of the dead were children – and, of course, children don’t normally commit suicide, do they? 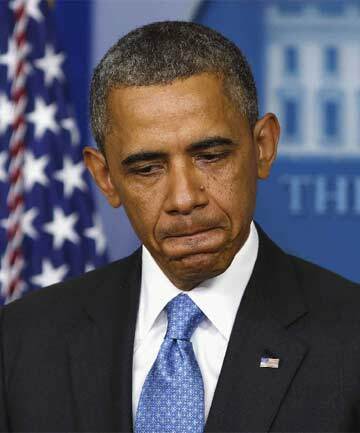 –63% believe the deaths were mass murder. –22% believe they were suicides. Mass murder, because children don’t “choose” suicide. Men with guns stood around until everyone had drunk the poisoned cool aide. Then they either drank it, or ran away. But those few men, who held the rifles were both murderers and the only few who actually committed suicide. No way this is a conspiracy. Jones and his followers killed a US Congressman, panicked and drank Kool-Aid. End of story. How do we know that they were shot except for verbal statements? …it’s madness! So much death and many things that don’t make sense. It’s either religious fanatics/cult or a corrupt government to blame and we know which explanation we’d rather go with. I vote unsure on this. This is a hard one to decide on there are so many sides to what the truth is and everyone has a different story to tell. 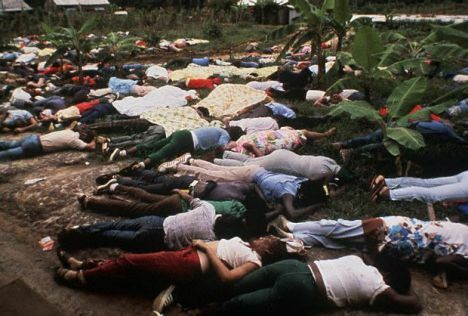 Jonestown: suicides or mass murder? Aerial view of Jonestown, Guyana. The Peoples Temple Agricultural Project was a predominantly American residential community in Guyana, South America. Branded a cult by the media, it was more commonly known as Jonestown in deference to its leader, Jim Jones, a former communist and drug addict, and son of a Ku Klux Klansman. Peoples Temple cult leader Jim Jones. The community made world headlines on November 18, 1978, when it was announced 918 people at Jonestown, including 200 children, had died. 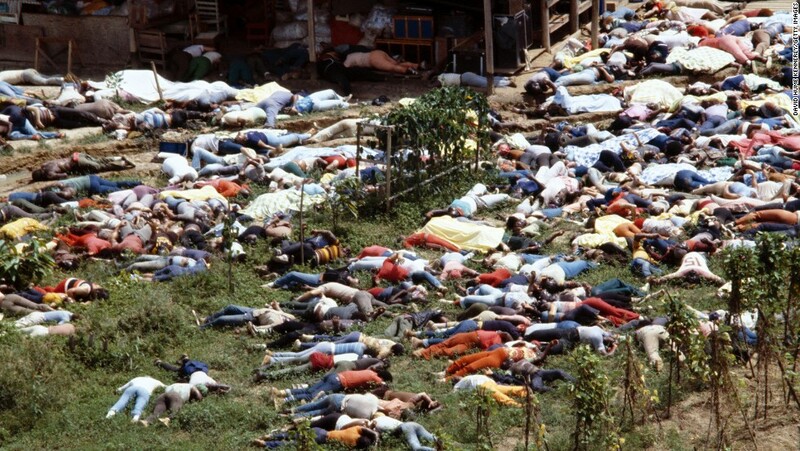 All but two Peoples Temple members died from cyanide poisoning in what was labeled “revolutionary suicide” by Jim Jones himself. 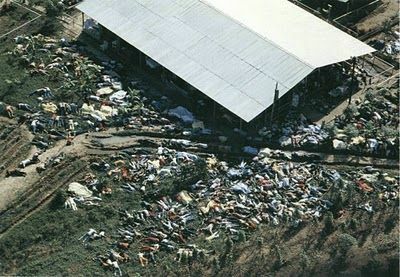 Jonestown after the ‘event’…ghastly and surreal. Besides the suicides at Jonestown, several surviving Temple members murdered five others, includingCalifornia Congressman Leo Ryanat the nearby Port Kaituma airstrip. Jonestown remained the largest loss of American civilian life in a single non-natural disaster until the deaths that occurred in the US on 9/11 in 2001. Everything covered so far in this chapter is the official version of what occurred at Jonestown. 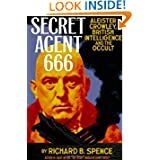 However, there have long been rumors of MK-Ultra experimentation with the commune before the tragic incident occurred, and CIA involvement before and after the incident. Crucial sources, including Jonestown survivors as well as local officials first on the scene, appear to radically contradict the mass suicide story. Cult members remonstrate with Jones (center) immediately before the ‘suicides’. The photographer was Greg Robinson, of the Examiner, who was one of the media reps killed at Georgetown Airport. If something other than the mass suicide the history books inform us happened in 1978 at Jonestown, then what did occur? 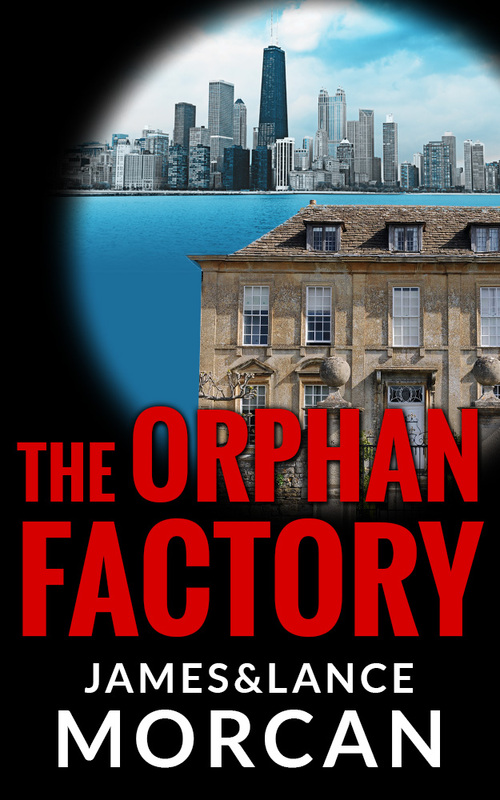 A dark social experiment, wholesale murder, CIA assassinations, mind control implementation gone wrong, or what? These, and more, have been touted as fact by independent researchers over the years. 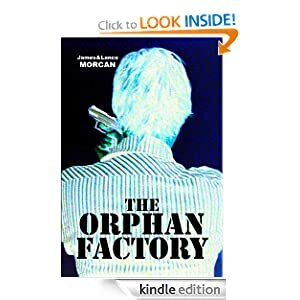 In The Orphan Factory, we explore these theories when Nine and another orphan-operative attempt an assassination, deep in Guyana’s Amazon rainforest, of a survivor of the Jonestown tragedy. Unusual anomalies within the US Government’s official version of Jonestown raise alarm bells as they do seem to point to a conspiracy. In fact, there were so many conflicting reports that it was, and is, difficult to make head or tail of the event. Senseless deaths surrounded by mystery…then and now. The Guyanese army, whose soldiers were among the first on the scene, reported only 408 Temple members had died by their own hand. Then the New York Times reported the actual number was around 500. 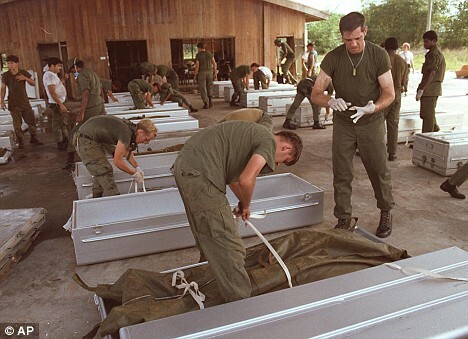 American Soldiers prepare bodies for shipment in coffins from Georgetown Airport, Guyana (above) while more bodies are unloaded in bodybags (below). There were also conflicting reports on the causes of death. The New York Times had reported the first medical official to arrive on the scene said he’d witnessed numerous gunshot wounds on victims. That didn’t tally with the official story that the majority had committed suicide by drinking cyanide. And no-one seemed to know exactly how many people were in Jonestown at the time. Therefore, reports listing 33 survivors couldn’t be verified. Local newspaper the Guyanese Daily Mirror reported that around 60 to 80 American Green Berets and several hundred members of the UK’s SAS Black Watch were performing military exercise drills in the jungles surrounding Jonestown at the exact same time the mass suicides or the massacre – depending on your take – occurred. Was that a coincidence or does it as some suggest point to a sinister outside party, or parties, being responsible for the deaths? 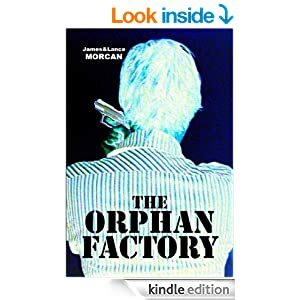 Another anomaly in the official version as told by the US Government was that the bodies lay neatly arranged in rows and showed no signs of the heavily twisted rigidity known to be induced in cyanide suicides. In the coroner’s court, Guyanese pathologist Dr. Leslie Mootoo stated the bodies looked like they’d been murdered and, in his opinion, were not suicides at all. Dr. Mootoo also said that while he did find gunshot wounds on a small percentage of the victims, he found needle marks on the vast majority. Needle usage would directly contradict the cyanide story as the official story says the cyanide was taken orally. The US Army, however, said the cause of death was irrefutably cyanide suicides. Interestingly, it was only after mounting pressure from family members of the deceased back in America that the Army finally agreed to perform some autopsies – seven out of 900 deaths to be precise. Those token autopsies were clearly too few to gain true insight into what caused the deaths. Californian Congressman Leo Ryan had flown down to Guyana to investigate strange irregularities at Jonestown shortly before the incident. 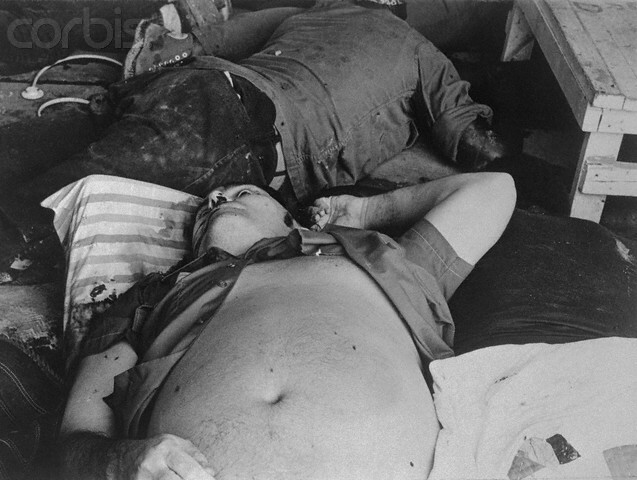 The bodies of Congressman Ryan and companions after the murders. It has been claimed by some Jonestown researchers that Leo Ryan, who had been a vocal critic of the CIA for years, had discovered the community was not being run by Jim Jones, but by the CIA; instead of allowing Ryan to return to the US to inform congress, the CIA killed Ryan then shut down the entire Jonestown program by instigating a massacre. Jonestown member George Blakey, who was a chief aid to Jim Jones, was later identified as a CIA agent. 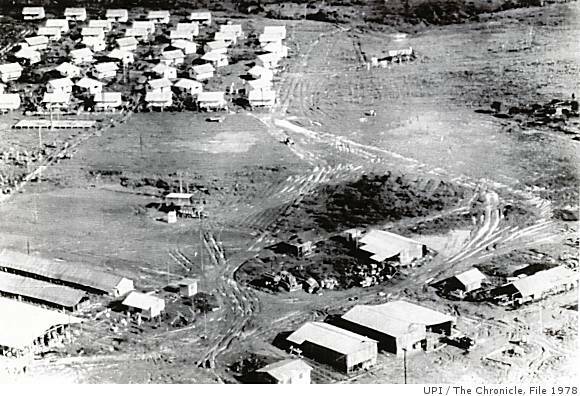 Blakey purchased the land on which Jonestown was built. That, together with his CIA involvement and the community’s tragic end, could reasonably point to it being some kind of bizarre agency experiment. What Blakey did immediately after the apparent Jonestown massacre lends weight to this theory. Within days, he reportedly moved to the nearby tax haven of Trinidad where he withdrew US$5 million from a Credit Suisse bank account. In another CIA connection, US Embassy official Richard Dwyer was with Leo Ryan at the time of the airfield shootings and was later confirmed to have been a CIA agent. The first report of the “mass suicide” was made via radio a couple hours after the deaths occurred. Nobody has ever confirmed who made the radio reports, but perhaps tellingly, Richard Dwyer was the only person at Jonestown known to have a working radio. Intriguingly, on the suicide tape recording of the last few minutes before the deaths occurred within the commune, Jim Jones can clearly be heard saying, “Get Dwyer out of here. 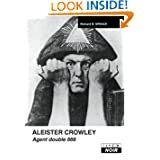 Take him out of here now before something bad happens to him.” This implies Jones and the CIA were in cahoots as the cult leader would not allow anyone else to leave the commune. Many independent researchers also believe the suicide tape was heavily edited to disguise the unmistakable sound of gunshots. If true, this also points to murders, not suicides. There are numerous theories suggesting Jonestown was a CIA test site for brainwashing and mind control. It has been claimed that Leo Ryan visited Jonestown because he’d uncovered evidence that Jonestown was a large-scale MK-Ultra experiment. In a potential red flag supporting this theory, the psychoactive drugs found in Jonestown included most of those used in the MK-Ultra program. Peoples Temple members in happier times. Many investigators have theorized that Larry Layton, a senior member of Jonestown, was also an undercover CIA agent. In what could be a telling connection, Layton’s father was in charge of the US Army’s Biological Weapons Research unit. Mere coincidence? Or was Jonestown a “research experiment” conducted by the military? 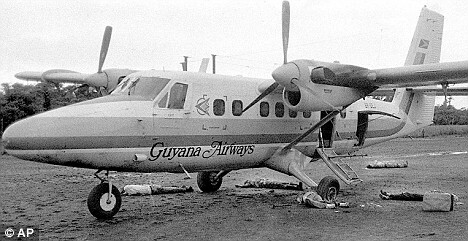 Larry Layton immediately after the killings at Georgetown Airport. Another thread that could link Jonestown with an MK-Ultra experiment is that US citizens were taken from mental hospitals and children were taken from orphanages in America and placed in the commune. 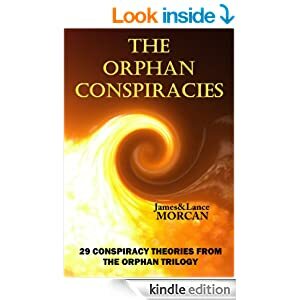 (You’ll recall from the declassified CIA documents mentioned in chapter 2 that it’s on the record mental patients and orphans were experimented on against their will under the MK-Ultra program). 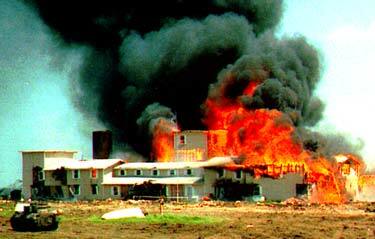 The 1993 Waco massacre of members of the Christian sect, the so-called Branch Davidians, in Texas, shares much in common with Jonestown: there were conflicting reports regarding cause of death, psychoactive drugs were found on the property and there was confusion surrounding cult leader David Koresh’s intentions. In fact, Waco had a whole host of eerily similardiscrepancies, not to mention traces of CIA involvement and possibly mind control operations as well. The US Government’s own reports emphasize that Koresh had repeatedly insisted suicide was not an option for him or his fellow community members. As with Jonestown, the commonly held belief that the entire religious community at Waco wanted to die doesn’t seem to hold true upon closer inspection. In addition to what’s been covered in this chapter, there have been several other prominent conspiracy theories concerning Jonestown, including one which plays on the communist connections with the cult and claims the Soviets were responsible. Some have even theorized the Jonestown massacre was some kind of sick “racial cleansing” experiment. As most Jonestown victims were black, some have argued it was a eugenics purification test conducted by white racists to prepare for even greater ethnic casualties in years to come. 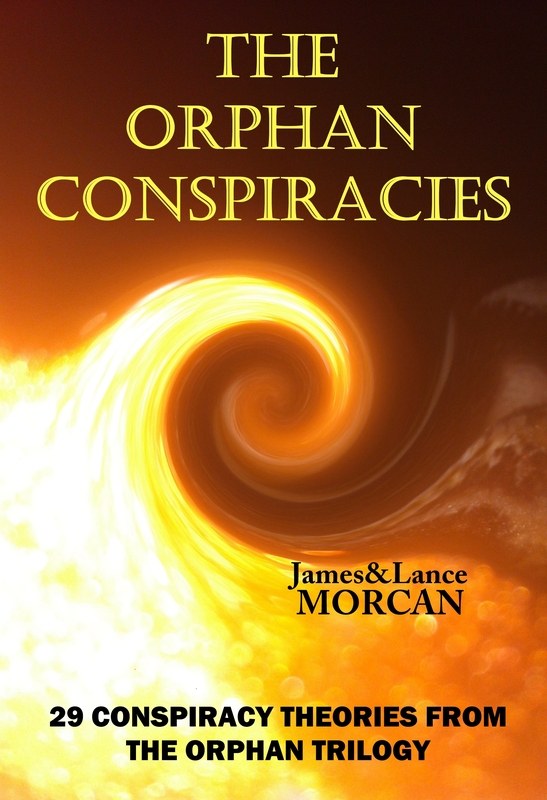 (See chapter 15 for more on eugenics). Another strange thing about Jonestown was Jim Jones’ corpse. 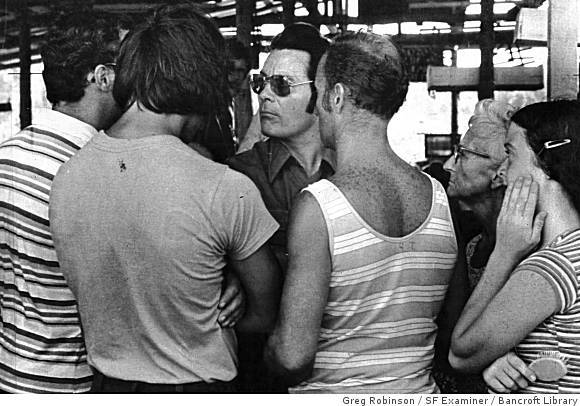 The Peoples Temple leader was known to have tattoos all over his chest. Yet the photos of his corpse found after his supposed suicide shows a chest free of tattoos. (See photo at right). America’s House Foreign Affairs Committee (HFAC) concluded the massacre was entirely due to Jones’ “extreme paranoia” and there was no outside interference from the CIA or otherwise. Strangely though, 5000 HFAC documents on Jonestown remain classified to this day. If the old adage Where there’s smoke there’s fire is true then Jonestown must have been a cover-up of some kind. And it does seem unlikely anyone could convince more than 900 people to willfully commit suicide, especially when so many were young children. Then again, our assumptions could all be wrong as brainwashing doesn’t only belong in the domain of intelligence agencies. Fanatical, brainwashed cult members all over the world have committed mass suicides. (Remember the Heaven’s Gate suicides?). And by all accounts Jim Jones was a megalomaniac. So it’s possible he killed himself and his devotees followed suit as per the official story. And who’s to say Jonestown members didn’t believe their leader was guiding them all into heaven?